When it's rainy or cold outside, the chances of hearing "I'm bored!" from your preschooler are pretty good. Rather than plunking her down in front of the television, why don't you suggest some preschool crafts instead? Partaking in the arts and crafts, mothers of preschoolers can get some good quality time with their children and perhaps indulge their rarely used creative side. 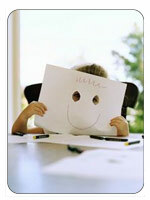 Crafts are great preschool activities because they give children the opportunity to be imaginative. It can also be educational. Wondering how to teach colors to preschool children? Crayons and paints are a great teaching aid. Trying to instill lessons on sharing? Then divide up the markers and tell your preschooler to ask before using one of your markers. Let's face it, being creative is messy work. Although you don't want to curb your preschooler's artistic flare, there's no reason you can't encourage her to keep things tidy when she's done. To help promote a clean working space, make sure you have lot's of stackable storage boxes. Write large, clear labels for each box so it's easy to know right away what's inside. Keep kid-friendly items, like non-toxic, washable markers, construction paper, and crayons, within easy reach of children. Other items that should be used with adult supervision, like scissors and glue, should be kept out of reach. Rather than piling a lot of boxes on top of the craft table and crowding your preschoolers work space, install some shelves to help keep the craft table empty. If your preschooler's craft table is used exclusively for crafts, then consider installing a paper roll dispenser on the under edge of the table. It works much like a toilet paper dispenser does except that the paper is much larger and is meant for drawing on. Whenever your child would like to work on another masterpiece, he simply needs to rip off a piece of paper. Here are some great craft ideas that your preschooler can do. Using different colored inkpads, make thumbprint designs. Use markers to draw faces or add details on the thumbprints. Thumbprint designs can make wonderful cards. Gather various items and rub an imprint of it onto a piece of paper. Use a leaf, coin, piece of tree bark, feather or anything else you can think of to place under the paper. This technique works best when you use crayons or colored pencils to do the rubbing. Experiment with different types of paper to see what kind of image you get. Finger painting is always fun for kids and adults alike. Be sure to wear a smock because you just never know where paint will end up. Using stretchy, nylon cord and beads, your preschooler can make her own jewelry. Use a safety pin or some tape to anchor down the thread. Big beads are best for little hands. Make some flowers out of egg cartons. Just cut out the individual eggcups and let your preschooler paint or color them. Once the cups are dry, grab some pipe cleaners, curl one end and then glue this end onto the bottom of the eggcup. You can cut the edges of the cup to make it look more like a particular flower. Eggshells can also be used to make the flowers, but are a lot more fragile to work with. Grab some paper bags and make puppets! Maybe you and your preschooler will want to come up with a story first that you can act out with the puppets after you make them. When the mixture has cooled down enough to touch, knead it until it is smooth and then start having fun!